So many uses for one amazing cloth! The Autofiber Zero Edge Car Detailing Towels clean glass, polishes chrome, dusts interiors, buffs away wax and polish residue, and makes quick detailing easy. It does all this without scratching thanks to the edgeless microfiber detailing cloth design. One touch and you'll think this baby blue microfiber cloth for car cleaning is for pampering your body, not your vehicle. Although it feels delicate, this multi-purpose microfiber cloth for cars is strong enough to tackle the toughest detailing jobs. The strength of these car detailing towels lies in millions of tightly-woven microfiber strands that loosen and lift dirt and debris. Once lifted, they re trapped inside microscopic spaces within and between these strands. 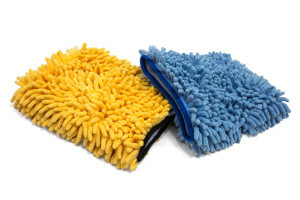 With short pile on one side and long pile on the other, one of these microfiber cloth car detailing towels takes care of every detailing need. 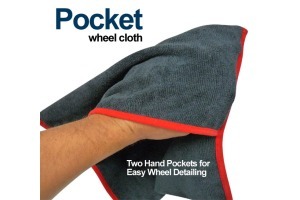 You can even fold the 16 x 16-inch car detailing towels in fours for easy handling, and to create eight different wet or dry cleaning surfaces. The long pile side works wonders with quick detail (QD) mists and spray-on waxes. The short pile side makes the perfect microfiber detailing cloth for cutting through wax and polish residue. When slightly dampened, the short pile side cleans glass and windows with ease, and without leaving streaks or lint trails. Pinched between thumb and forefinger, a single swipe removes fingerprints and smudges along window edges. When dry, gently abrasive microfibers break apart wax and polish for easy removal without damaging paint or clearcoats. This microfiber cloth for polishing cars can even cut through stubborn stains and water spots, too. Whether hand polishing, waxing and final buffing, restoring shine to chrome, removing dust from interiors and picking up grime from hard-to-reach places, this edgeless microfiber detailing cloth for cars does it all. Machine washable convenience – Machine or hand wash separately or with other microfiber items in warm water and mild detergent or hand soap, rinse, and air dry. Bleach, fabric softeners and high heat are not recommended. Superabsorbent and nonabrasive – Microfiber towels for car detailing can be used wet or dry to clean, buff and polish without damaging paint, clearcoats, plastic or other finishes.